Extension set for the TELINDEX A5 telephone ring binder. 10 ruled inserts for up to 60 entries. The exclusive telephone ring binder has 25 lined card inserts for addresses, telephone and fax numbers for 150 entries. With a 12 part A-Z index. 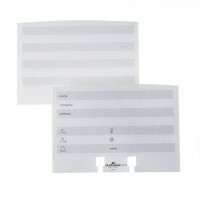 Address card file with 500 double-sided index cards (104 x 72 mm). Complete with 25 part A-Z index. The card file allows simple removal and insertion of the cards. The elegant telephone ring binder has 25 lined card inserts for address, telephone and fax numbers for approx. 250 entries. Extension set for the TELINDEX and TELINDEX economy telephone ring binders. 10 ruled inserts for up to 80 entries.